Under the direction of former NASA program manager Nathan Eskue, students built, launched (and recovered!) a stratospheric balloon. Some things went right. Some did not. But make sure it is digestible. “If the group is unified in the end goal that they’re trying to solve, many communication issues are prevented because the team understands the big picture problem,” Nathan said. Identify internal and external stakeholders early on, share wins and losses and proactively seek out feedback. Students learned quickly that pitching to professional groups and local companies is not the same as pitching to K-12 partners. Both have limited time and resources, but the “Why?” for a middle school science teacher and an aerospace engineer is going to be considerably different. 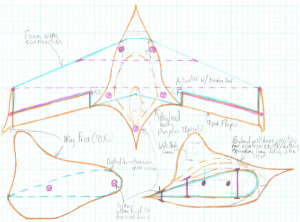 Shout out to the Local Motors engineering team for sharing tips on crowdsourcing design! And Discord makes collaboration easy. Professor Eskue suggests that when starting a large, uncertain or risky project, the team should work together collectively to identify a project management process that works for everyone. “It should be as simple as possible, and the team should use it as the main communication tool.” Professor Eskue's team worked in an Agile environment, which helped them increase productivity and improve the rapid prototyping process by emphasizing repeatability and documentation. “Collaboration is one of the most vital facets of any tech project. When team members collaborate effectively, the team can proactively identify and resolve problems before they even occur, said Roberto Perry, a U.S. Navy veteran and Robotics & Embedded Systems student at the University of Advancing Technology. 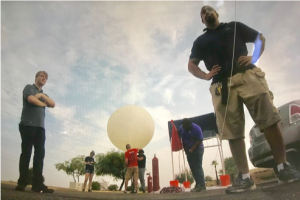 The team of UAT students who worked on the stratospheric balloon project includes students from widely different degree programs, including Advancing Computer Science, Business Technology, Digital Maker & Fabrication, Game Programming, Robotics & Embedded Systems and Virtual Reality. 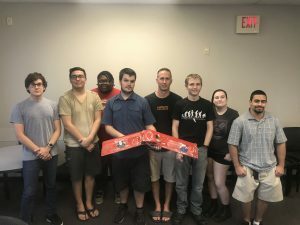 “Without all of these disciplines working together, this project would not have been able to fly,” said Jill Coddington, UAT advancing computer science program champion and mom joke aficionado. “You are not just a programmer or a robotics technician—you are a team,” Jill added. “You have to start building prototypes early in the process, accept that they will be far from perfect, learn from them and repeat the cycle as many times as possible before your deadline,” Nathan said. When you design new technology from scratch, you encounter problems. For example, the team’s first balloon ended up somewhere in the Superstition Wilderness. 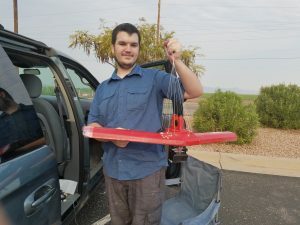 For their second attempt, the team developed a GPS-enabled glider that improved the accuracy of the flight path. Roberto learned a lot about the capabilities and limitations of different GPS systems, power supply, data transfer, microcontroller circuit design and integration of different devices. But he also learned a lot about failure and teamwork. “When you’re creating new technology using custom tech designs and working on a diverse team, you will fail. But you fail as a team, and that failure leads to new discoveries, which eventually lead to success,” Roberto said. Want to join the UAT space exploration team? Check out our unique degree programs here. Are you with a local company or school that wants to collaborate on the project? Reach out! marketing@uat.edu.